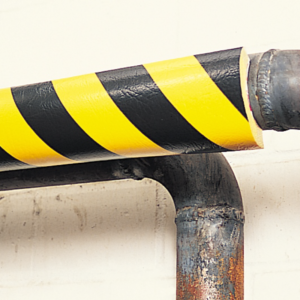 Real Safety can deliver all types of corner, edge, surface and pipe protection. Do not let safety awareness slip your mind - protect it! Our safety bumpers ensure effective head protection as these bumpers both, warn at high visibility and protect the head from damage by absorbing any impacts. We, Real Safety, can deliver all types of corner and edge protection. Our safety bumpers are perfect for corner and edge protection, and there are many good reasons to secure dangerous edges and corners. It always hurts badly to knock something against a hard and sharp edge, and if you are really unlucky, such a clash can have fatal consequences. If the edge is very sharp, it can actually make harmful cuts in the skin. Therefore, you should use safety bumpers everywhere where there are sharp and hard edges to be found. 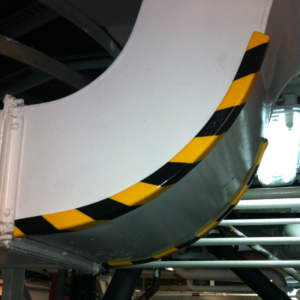 We offer a variety of safety bumper solutions. We offer, among other things, highly expressive safety bumpers that catch the eye, and thereby clearly draw attention to potential danger. However, we also have safety bumpers in more muted colors. We provide safety bumper solutions for both, private individuals and businesses. Companies that have warehouses often benefit greatly from our safety bumpers, as traditionally, there are often many sharp and hard edges around warehouses. 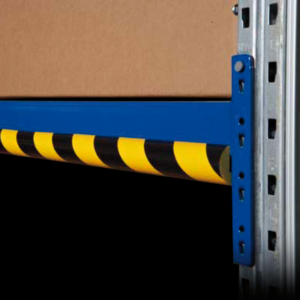 There can be many reasons for safeguarding dangerous edges and increasing the safety of a warehouse. A layer of sharp and hard edges is in many ways an accident waiting to happen and when an employee is injured in the workplace, it is very costly. First of all, it is not pleasant to witness an accident that could have been avoided. Simultaneously, it is not good to have to do without the employee subsequently, while he / she recovers from the accident. Moreover, accidents contribute greatly to creating a bad reputation for one's business. We are specialists in increasing safety at work and at home. Sometimes, people thet are not part of our industry might have a difficulty in assessing to what extent, and not least how exactly their home or workplace should be secured. We have our hearts set on offering our expertise and advising both business professionals and private individuals. Do not hesitate to call us at +45 26 11 44 66 if you have any questions about safety optimization of your home or business. You are also welcome to send us an email at realsap@realsap.com. Our range of safety bumpers is large and diverse. They are available in many different forms; in other words, we have security bumpers for all surfaces, joints and edges. 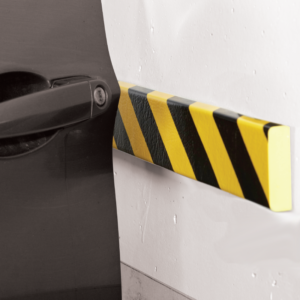 Our safety bumpers are extremely easy to install. This is due to the product's texture; it is actually a flexible and easily adaptable product. There are of course some surfaces onto which our security bumpers are harder to mount than others. If you have any doubts about how to mount the product based on the detailed instructions provided, you can always get help and advice from us. In addition, we would like to mention a few rules of thumb, including the installation of the product. If the surface is grease-free and clean, you can usually mount our safety bumpers with ease. Should they be mounted on concrete, we recommend that you use a special adhesive. The entire team at Real Safety has broad knowledge of safety optimization. Should you have any questions regarding safety bumpers, we will gladly offer our expertise and knowledge. We can be reached by phone and by mail. Call +45 26 11 44 66, or send an email to realsap@realsap.com. Please fill out the form with your contact informations and we will contact you as soon as possible.